madebyzen 101 Ultrasonic Aroma Diffuser utilises modern ultrasonic technology, aromatherapy and mood lighting, to create the perfect ambience that will awaken the senses and calm the mind, body and soul. With colour changing lighting that gradually changes through the complete colour spectrum and intermittent mist control, this ultrasonic diffuser ionises and hydrates the room`s atmosphere, bringing a touch of luxe to every day living. Advanced ultrasonic technology produces vibrations at a very high frequency, breaking up water and fragrance or essential oil into micro-particles. These particles are then diffused into the air in the form of a fine, cool mist without the use of heat. Use with an essential oil blend, fragrance oil or your favourite perfume oil. madebyzen Aroma Diffusers are applicable to areas such as, bedrooms, living spaces, offices, pet areas, gymnasiums, hotel rooms and hospital/clinic areas. 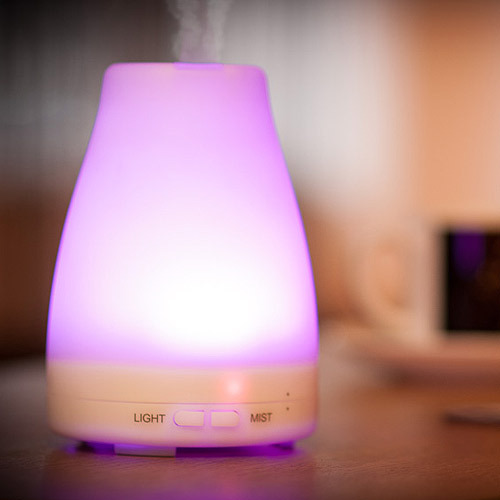 Aroma Diffuser: Fragrances your surroundings healthily and effectively. Use with an essential oil, fragrance oil or your favourite perfume oil. As no heat source is required, essential oils are not degraded. Mini Humidifier: Hydrates and moisturises without creating condensation; ideal in today`s central heated or air-conditioned environments. Air Purifier: Improves the quality of the air you breathe. As no smoke is produced - only a fine water mist makes these diffusers ideal for any time or place. Ioniser: Produces "feel good" ions. Inspired by the beauty of pure, timeless and modern design, madebyzen is a British lifestyle brand, dedicated to bring a touch of beauty, luxury and enjoyment through its burgeoning collection of home accessories and fragrances. 1. Insert the AC adaptor into base of unit and connect to the mains. 2. Remove the cover by twisting anti-clockwise. 3. Fill the water tank with ordinary tap water. Please take care not to exceed the maximum water level line. Note: do not attempt to fill the unit with water whilst it is switched on. 4. Add 3-5 drops of your favourite fragrance or essential oil to the water. 5. Replace the cover by twisting in a clock-wise direction. Do not attempt to use the aroma diffuser without replacing the cover. 6. Once the mains supply is switched on, press the mist button once. This will turn the mist function on. (Red light will be visible). Note: if there is an insufficient amount of water in the tank, the unit will turn off immediately, even if the power supply is connected. 7. To turn on the 30 second intermittent mist setting, press the mist button once more. (Green light will be visible). Whilst in this mode, the mist will go on and off every 30 seconds. 8. Press the mist button once more to turn off the mist completely (no light is visible). 9. To turn on the colour changing mood lighting, press the light button once. 10. To change the LED light and set it on one colour, keep pressing the light button until you have reached the colour you would like. (Aroma diffuser will now stay on set colour). 11. To turn off the light you must keep pressing the light button until you have reached no light option. Note: When not in use, empty the water from the tank and clean using a swab or cloth. Do not exceed the maximum water level line, as indicated on the water tank. Do not switch on power when the water tank is empty. Do not touch the ceramic disc. Clean regularly as per maintenance instructions. Always unplug from power before carrying out any maintenance. For hygiene reasons, always pour away remaining water from the "drain side" and clean with a soft cloth. Essential oils can stain. In the event of spillage, please clean the surface with a clean, damp cloth. Always use a pouring cup to fill the water tank. Never fill the unit directly under the tap. Do not let mist blow directly onto furniture, clothing or walls etc. Keep away from direct sunlight or heat sources. Always keep on a flat, even surface. Do not place on a carpet, duvet or unstable surface. Keep away from electronic equipment e.g. TV, stereo etc. Be careful not to tilt or knock over the product. This could cause water to enter the mechanism and cause malfunction. Do not use for more than 3 hours at any time. Wait up to 60 minutes before restarting the unit to avoid damage. Use tap water only. Do not use mineral or sparkling water. Keep out of reach of children and pets. This product is not a toy. Keep cord clear of pathways and do not pull forcefully at any point. If smoke or a peculiar smell is detected, unplug the unit immediately. 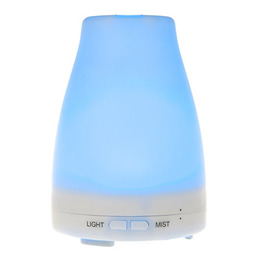 Below are reviews of madebyzen 101 Aroma Diffuser - Mini Humidifier by bodykind customers. If you have tried this product we'd love to hear what you think so please leave a review. Lovely item - quite small but can run through most of night if left on intermittent flow. I love this product, it is brilliant and does its job perfectly.